fabulous combo or equally as cute as seperates. 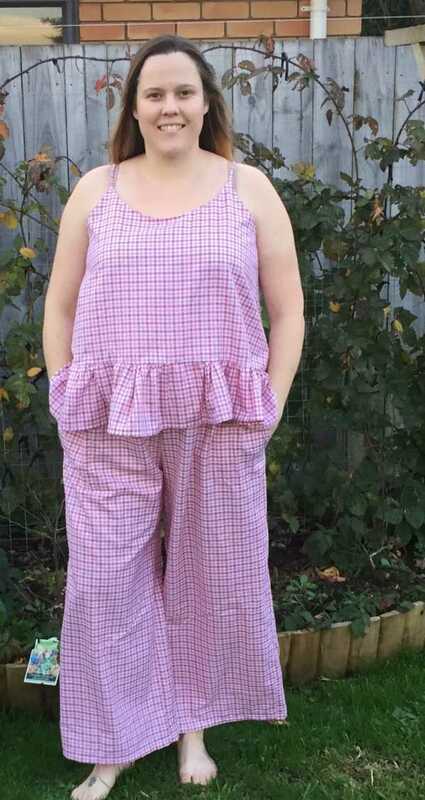 is a cami, relaxed elastic waist shorts or long pyjama pants. The Ella Cami as an easy to wear, lovely simple shell top with a fun gathered lower frill. shorts for a cute summer play suit. Add on the long pants and you have a fabulous and playful pyjama set. Be sure to join our Designer Stitch Pattern Support Group on Facebook for a very special discount code just for our members! Click here to join and read the pinned post to get the code. – For Cami Top only – Georgette and Georgette types. Want to make your Ella combo even more special ? Team it with the Willow to extend your gorgeous Ella even further. Click here to see how fabulous the Willow is. URL links and clickable page navigation to resources that help you construct the Ella.